Bottle of sake is called choshi or tokkuri. 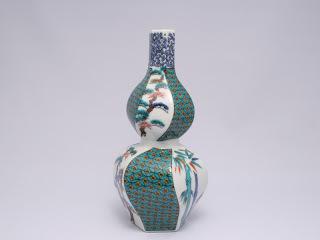 It is used for serving sake when we drink. We buy sake in large bottles. When we drink sake, a smaller portion is poured into the choshi. To warm up the sake, the sake in the choshi is put into boiling water or microwave. Tokkuri is same as choshi, but big bottles of sake are only called tokkuri. Most of tokkuri had been owned by sake shops a long time ago. It was printed with the shop logo or name. People bought sake in tokkuri. Recently cold sake has boomed. There are many glass made choshi in Japan. Glass made choko is used for only cold sake. I know Satsuma Kiriko glass ware is so beautiful and so expensive. I want to sell that at my web shop. If I get it, I will present it in the blog. My dad told me that people lay down choshi or tokkuri when it is empty. It is the empty sign for other people or the waiter/waitress. Because, bottles are ceramic, nobody can see how much sake left in it. It is COOL, if you do that at sushi bar!